The X2000 has tack sharp 2K video with good color and exposure. It includes a mounting system for drone and FPV use but is not compatible with most action cam hardware. 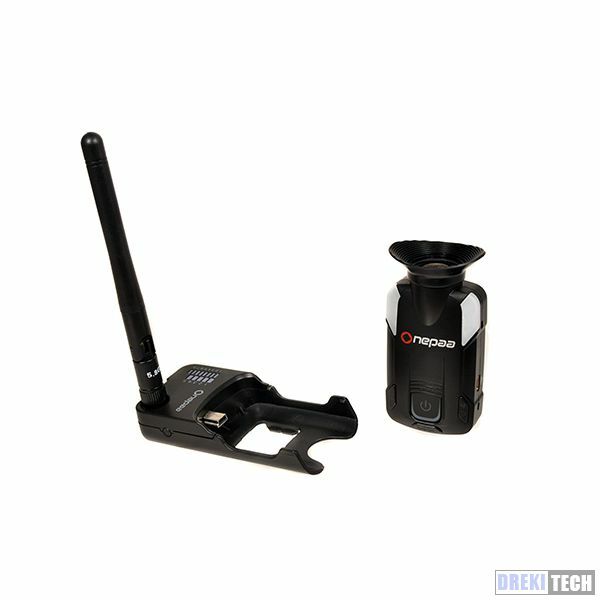 The camera does not have a screen, but instead includes a 5.8ghz wireless video transmitter. Design and Build Quality: This camera is small, light and simple. Since there is no screen built in, it is necessary to connect the camera to the app with the external Wi-Fi dongle or use the 5.8ghz transmitter to change settings and line up shots. The camera itself has no mount built in – the mounting hardware clips onto the camera and is not compatible with any standard action cam adapters so do not expect to easily use this camera on your bike or your car. I wish OnePaa included an adapter for standard action cam mounts because that would make filming comparison footage a lot easier, but at least they included a tripod screw thread. Video Quality (Day): 2K video with this camera is sharp and detailed. In daylight the colour is pleasing and accurate. Transitions between dark and light scenery is smooth. The gyro sensor does do an adequate job of nulling any bumps and bouncing – do keep in mind that this footage is filmed entirely handheld – but I found when the camera is set to rotate mode it doesn’t work so well, and actually creates a bit of a jello wobble effect. The only other criticism I have of this camera is its bitrate. As it stands right now the bitrate is on the low side and in some scenes I ran into issues with compression artifacts including blocking in smooth gradients of colour. This camera is otherwise capable of shooting some high quality video and is tack sharp for most scenery. Video Quality (Night): As it gets darker the X2000 keeps up pretty well. In low light I did not notice much noise. In fact, noise is kept mostly in check until it gets pitch black and even then the camera retains a decent amount of detail. It’s not the brightest video but things are still visible and there’s not much noise so it’s a decent trade off for a camera that will primarily be used during the day. Audio Quality: Audio quality is a little on the quiet side, but what comes through is clear. Here’s what it sounds like […]. Other Notes: I could see this camera being a decent dash cam, but right now it does not have an start-with-power feature so it would need to be manually turned on every time. It’s probably best to not leave a camera like this in the car anyways, since it has a big battery built in and batteries don’t like heat. I commend OnePaa for correctly advertising this product as 2K capable and not trying to interpolate to 4K. The result is great quality video in 2K. I did have a few little criticisms but overall this appears to be a solid camera for the cost. After pressing the Wifi button on the right I was able to see the WiFi signal on my iPhone X20004e11e866f328, but unfortunately it did not connect using the standard password 12345678. It continues requesting for the password. I tried introducing the 12345678 password several times with no connection whatsoever. Do you have a way of resetting the OnePaa to its factory default or do you have an alternative password I can use? What do you suggest? I do not know how it happened but it did connect only once and I was able to open the OnePaa app but unfortunately there was no live image except some controls on a black screen, controls that I pressed and did nothing. In the meantime the red and white flashing lights had turned only red. I didn’t know what that meant. Please let me know if you think either the camera or the transmitter are defective and if I should request for a new one. Also let me know if you have a more detailed User Manual with all the flashing alternatives and times to press buttons. Many users will really appreciate it. Hello, I was finally able to connect. Thank you. come hai risolto per favore? ho gli stessi problemi. SooCoo C30 Deal – Only $36! © DrekiTech - Disclosure: This site uses affiliate links - we get a commission if you use them to buy a product with our partners. Learn more.